Business leaders have criticised the quality of university graduates, complaining they lack basic organisational skills. The Confederation of British Industry is launching a new higher education taskforce with university leaders. Its leaders have questioned whether universities are producing too many graduates. 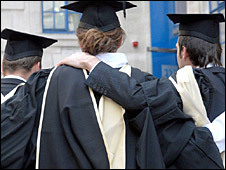 Higher Education Minister Bill Rammell says the UK needs more graduates if it is to stay competitive. CBI director-general Richard Lambert said many bosses were unhappy about the "soft skills" of graduate applicants. He said many left university with inadequate communication and language skills, while some even lacked the ability " to get up in the morning." Mr Lambert said the new taskforce - made up of leading business people as well as university vice-chancellors - would explore what business needed from graduates and how universities could better prepare them for the world of work. He said so-called "soft-skills", such as time-management or communication, could be improved - possibly with specific training at university. One example was the compulsory "World of Work" programme at Liverpool John Moores University which trains students in basic office skills - including turning up on time. The president of Universities UK, Rick Trainor, who is also a member of the CBI taskforce, denied that such courses would turn universities into mere "training camps for jobs". He argued work skills were just as vital for effective studying and said: "On this I see no fundamental conflict between the aims of universities and business." The taskforce will also look at the "shape and size" of the graduate workforce. The CBI's figures suggest there is currently an excess of graduates, with 10.1 million graduates chasing only 9.1 million graduate-level jobs. However Mr Lambert said the real concern was over "quality rather than quantity". There was a particular concern about a shortage of graduates in the so-called "Stem" subjects of science, technology, engineering and maths. Minister for Higher Education Bill Rammell disputed the suggestion that there were too many graduates. "All the reputable research, both domestic and international, suggests that we will need a significant increase in the number of graduate level jobs and we need to equip ourselves to meet that level if we are to remain economically competitive," he said. "The government is determined to do this." The taskforce chaired by, Sam Laidlaw - chief executive of Centrica - will seek to influence higher education policies at a time when all three political parties are reviewing their positions. The most controversial question is the future of tuition fees and next year the government is due to review the current £3,145 cap on what universities can charge . Mr Lambert said that he personally thought a higher proportion of GDP should be spent on university funding, but declined to say whether that should come from the government or from private sources such as higher tuition fees. He added that universities were "the engines of the economy". The 18 member taskforce of leading business people and university vice-chancellors will carry out its own research and produce a final report in June 2009. • In an effort to tackle the lack of practical experience students acquire, the ConstructionSkills sector skills council has organised a Constructionarium project at the National Contruction College in Norfolk - initially created by staff at Imperial College London to complement their classroom teaching. More than 1,000 students on construction-related degree courses at a dozen universities have received practical skills training there this year. The council's head of standards and qualifications, Nick Gooderson, said: "By giving students a solid grounding in exactly what life is like on a construction site, we can help them adjust to life in the working world when they graduate."